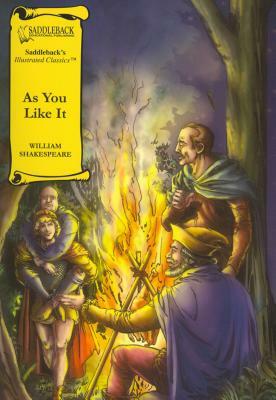 As You Like It [With Book] (Abridged / Compact Disc) | The Drama Book Shop, Inc. This series features classic Shakespeare retold with graphic color illustrations. Educators using the Dale-Chall vocabulary system adapted each title. Each 64-page, softcover book retains key phrases and quotations from the original play. Research shows that the more students read, the better their vocabulary, their ability to read, and their knowledge of the world. Orlando makes his way to the court of Duke Frederick, and falls desperately in love with the Duke's niece, Rosalind. Meanwhile, in the Forest of Arden, the Old Duke is living peacefully after having his throne usurped by his brother, Frederick. Orlando learns about a threat on his life and flees to the forest. Shortly thereafter, Rosalind is banished by her uncle and also seeks safety there disguised as a boy. Will the Old Duke recognize his daughter? Will the lovers be reunited?